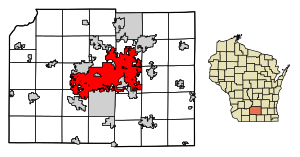 Madtown, Mad City, "The City of Four Lakes"
Location of Madison in Dane County, Wisconsin. Lua error in Module:Location_map at line 488: Unable to find the specified location map definition: "Module:Location map/data/USA Wisconsin" does not exist. Madison is the capital city of Wisconsin, a state in the United States of America. As of the 2000 census, it has a population (people living in it) of 221,735, making it the second largest city in Wisconsin. It is the county seat of Dane County. Madison is also home to the University of Wisconsin. Wikimedia Commons has media related to Madison, Wisconsin. This page was last changed on 6 November 2018, at 23:28.